The free-spending First Lady of Zimbabwe Grace Mugabe owns luxury homes around the world and recently paid £300,000 for a Rolls-Royce. 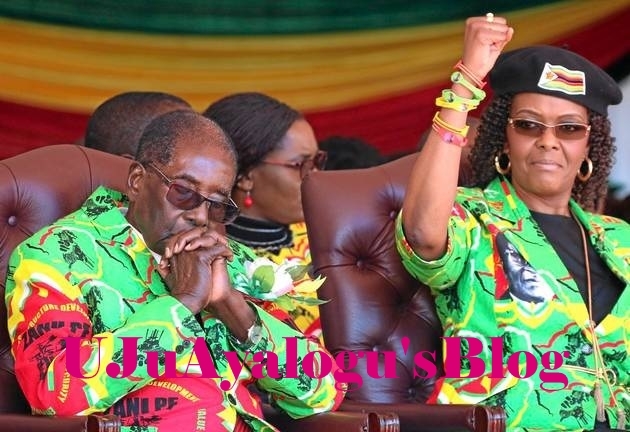 Dubbed ‘Gucci’ Grace for her love of spending, the wife of deposed dictator Robert Mugabe is renowned for her extravagant purchases and eye-watering shopping trips around the world. The 52-year-old, currently under house arrest with her husband, 93, at their 25-bedroom Blue Roof mansion in Harare, has lavished millions on jewelry, including £200,000 on a diamond-studded headboard. She is widely loathed in Zimbabwe and the population has been incensed by reports of a lavish lifestyle that once saw her spend £120,000 on one shopping spree in Paris. The couple’s children appear to have acquired their parents’ taste for luxury. Their youngest son Chatunga posted a video on Snapchat showing himself pouring £200-a-bottle Armand de Brignac Champagne over a £45,000 watch on a night out in South Africa. He bragged that he owned the timepiece because ‘daddy runs the whole country’. Grace began an affair with Mugabe while working as one of his typists and while his first wife, Sally, was terminally ill.
Mugabe’s marriage to Grace in 1996, dubbed the “Wedding of the Century” in Zimbabwe, was an extravagant Catholic affair. And each decade of the old dictator’s life was marked with ever more expensive partying — his 90th year being marked by a celebration costing £600,000. And by 2014 her spending on luxury goods was running at £2 million a year. That year’s shopping list included 12 diamond rings, 62 pairs of Ferragamo shoes, 33 pairs made by Gucci and an £80,000 Rolex watch. After one trip to London, where she stayed in a suite at Claridge’s, the First Lady was asked how she could justify spending so much on designer shoes. “I have very narrow feet, so I can only wear Ferragamo,” came the reply. A diamond ring purchased to celebrate her 20th wedding anniversary cost her £900,000, although she later sued the dealer in question for failure to deliver. In a further act of retaliation, the First Lady threatened to seize the businessman’s properties in Zimbabwe — hardly a new tactic for a woman who has managed to acquire no fewer than five dairy farms with funds that simply appeared out of nowhere. No expense was spared when Mugabe’s only daughter, Bona, married in 2014. It is estimated that some £3 million was spent on the ceremony, including £500,000 to upgrade the road leading to the venue, a country club. Some 4,000 guests attended. There are claims that the money funding this lifestyle came from the country’s diamonds. Like other members of the ruling clique in Zimbabwe, the Mugabes take their share of proceeds from the Marange diamond fields near the Mozambique border.